In a nondescript driver’s license center along the Susquehanna River in Harrisburg, five PennDOT employees decide what meets the definition of offensive. Plays on “WEED” or “ACID” — prohibited. 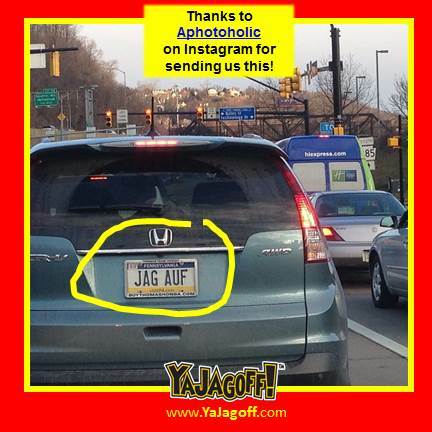 So is the Pittsburgh term for an obnoxious person: “JAGOFF” and corresponding forms. As an FYI, a couple of years ago, the Pittsburgh City Paper’s Chris Potter wrote an inside-back-cover full page article about the history of the word Jagoff. Might it be one of our followers getting a plate that says FFOGAJ so that , when you hold it in a mirror, you see it? In the meantime, to the people running “The Commonwealth Whose Name is Banned By YaJagoff,” LIGHTEN UP Ya Jagoffs!!! In the comments section below, feel free to add OTHER potentially offensive words that should be banned OR other ways to get Jagoff on to a license plate.